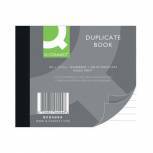 Q-Connect Feint Ruled Duplicate Book 102x127mm KF04094 Pack of 1 Q-Connect Duplicate Books. Quality duplicate books feature, perforated white ruled top sheets, plain white copy sheets, numbered pages 1-100, index in the front and supplied complete with carbon paper. Size: 102x127mm. Q-Connect Feint Ruled Duplicate Book 210x127mm KF04095 Pack of 1 Q-Connect Duplicate Books. Quality duplicate books with perforated white ruled top sheets, plain white copy sheets, numbered pages 1-100, index in the front and supplied complete with carbon paper. Size: 210x127mm. 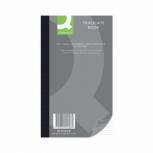 Q-Connect Feint Ruled Triplicate Book 102x127mm KF04097 Pack of 1 Q-Connect Triplicate Books. Quality triplicate books with perforated white ruled top sheets, plain white copy sheets, numbered pages 1-100, index in the front and supplied complete with carbon paper. Size: 102x127mm. 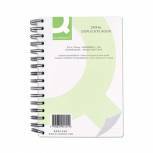 Q-Connect Duplicate Telephone Message Book 200 Messages KF26034 Pack of 1 Q-Connect Spiral Bound Telephone Message Book. Make instant duplicates that never get lost, each book contains 200 carbonless messages, the top copy is easily removed while the bottom copy stays in the book. 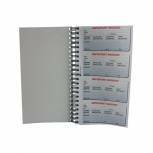 Challenge Carbonless Duplicate Book 100 Sets 210x130mm (Pack of 5) 100080458 Pack of 5 Ruled duplicate book. 100 numbered sets with Blue copy page. Index at front. 210x130mm. 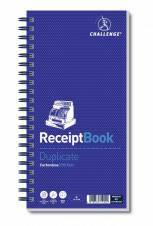 Challenge Duplicate Receipt Book 200 Sets 280x141mm 100080056 Pack of 1 Receipt book provides clear and accurate record keeping for quick reference. Carbonless format in duplicate. Colour coded with top copy and Blue duplicate copy. Wire binding. 200 sets. 4 receipts per page. Q-Connect Duplicate Telephone Message Book 400 Messages KF01336 Pack of 1 Q-Connect Spiral Bound Telephone Message Book. Make instant duplicates that never get lost, each book contains 400 carbonless messages, the top copy is easily removed while the bottom copy stays in the book. 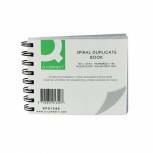 Q-Connect Feint Ruled Wirebound Duplicate Book 210x127mm KF01341 Pack of 1 Q-Connect Spiral Bound Duplicate Book. Contains 100 carbonless sets of White and Blue sheets, each page numbered and the top sheet perforated. Supplied with a removable index card that can be used as a writing shield between each set. Size - 210x127mm. 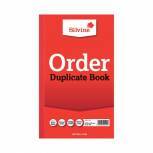 Silvine Duplicate Order Book 210x127mm (Pack of 6) 610 Pack of 6 Silvine Duplicate Book. Manufactured from quality bank paper with laminated red covers. Features include white pages numbered from 1 to 100 with an index sheet and carbon paper. Pre-printed - Order. Size: 210x127mm (8.25x 5). Ref: 610. Q-Connect Feint Ruled Wirebound Duplicate Book A4 KF01342 Pack of 1 Q-Connect Spiral Bound Duplicate Book. Contains 100 carbonless sets of White and Blue sheets, each page numbered and the top sheet perforated. Supplied with a removable index card that can be used as a writing shield between each set. Size - A4 297x210mm. 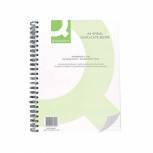 Q-Connect Feint Ruled Triplicate Book 210x127mm KF04098 Pack of 1 Q-Connect Triplicate Books. Quality triplicate books feature perforated white ruled top sheets and plain white copy sheets. Numbered pages 1-100. Index in the front and supplied complete with carbon paper. 210x127mm. 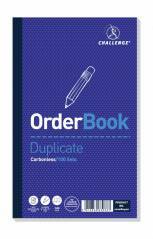 Challenge Carbonless Duplicate Order Book 100 Sets 210x130mm (Pack of 5) 100080400 Pack of 5 Challenge Duplicate Books. Ruled. 100 numbered sets with Blue copy page. Index at front. 210x130mm. Order. 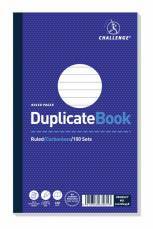 Challenge Ruled Carbonless Duplicate Book 100 Sets 105x130mm (Pack of 5) 100080487 Pack of 5 Ruled duplicate book. 100 numbered sets with Blue copy page. 105 x 130mm. 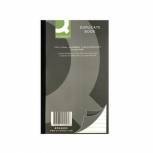 Q-Connect Feint Ruled Wirebound Duplicate Book 102x127mm KF01340 Pack of 1 Q-Connect Spiral Bound Duplicate Book. Contains 100 carbonless sets of White and Blue sheets, each page numbered and the top sheet perforated. Supplied with a removable index card that can be used as a writing shield between each set. Size - 102x127mm. 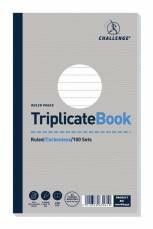 Challenge Carbonless Triplicate Book 100 Sets 210x130mm (Pack of 5) 100080445 Pack of 5 Ruled triplicate book. 100 numbered sets. 210 x 130mm. Silvine Duplicate Invoice Book 210x127mm (Pack of 6) 611 Pack of 6 Silvine Duplicate Book. Manufactured from quality bank paper with laminated red covers. Features include white pages numbered from 1 to 100 with an index sheet and carbon paper. Pre-printed - Invoice. Size: 210x127mm (8.25x 5). Ref: 611. 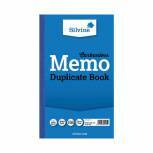 Silvine Carbonless Duplicate Memo Book 210x127mm (Pack of 6) 701-T Pack of 6 Silvine Carbonless Duplicate Book. Manufactured from quality paper, white pages numbered from 1 to 100 with an index sheet. Ruled Feint - Memo. Size: 210x127mm (8.25x5). Ref: 701.